Apologies if some of the pictures are not fantastic quality. It was dark in the church, and the fabric appears much shinier than it really is, because of the flash. The pattern is Butterick 4452. I liked the fact that, while the front is quite simple, with a slim A-line skirt, the back on the other hand features a laced closure and two deep box pleats on each side of the skirt’s middle. The back neckline is interesting as well. This way, the dress felt very “me” in that it wasn’t a busy, poofy gown in which I would have felt very uneasy and costumed; but the details in the back still made for an original and interesting gown. I shortened the train a little from the original design. I wasn’t keen on the train at first, but when I made the skirt and tried it on, the train looked so graceful that I compromised with a shorter train – but did retain it. 🙂 I also believe the effect of the deep pleats in the back would have been lost without a train. The line, with a flat, narrow front and a fuller back, reminds a lot of the tournures of the late 1800s/early 1900s. That is why I called that dress the Henry James Gown, while I called the empire dupioni gown the Jane Austen Gown. I know neither of them are in any way historically correct, of course; but the figures they create are reminiscent of those two periods – and Austen and James are among my best-best-loved authors. The bodice is lined, underlined and boned; the skirt is underlined. I used batiste for the lining/underlining (left over from the dupioni gown). For the gown, I used a fabric that was labelled as “indiscriminate” in the fabric store (which is probably why I got it for a good price), but which to me is most definitely taffeta. I got it in the designer/bridal/evening section of the store, where most fabrics are around 70 euros/metre, if not more. The “cheapest” fabric in that section is 25 euros. That bolt was hidden away in a corner and because it was labelled “indiscriminate”, it was only 6 euros a metre. It caught my eye because I absolutely loved the colour and dull sheen. I needed 2,5 metres for my gown. The pattern cost me 9 euros, which is the usual price in France, but is expensive to me! I usually get my patterns from the US or the UK, and even with the shipping fees, they are often half that price, thanks to the $/€ conversion rates. I honestly don’t know what’s wrong with craft stores in France. However, since I decided to make that dress 10 days earlier, I couldn’t possibly order it online or it would never have been there on time. That is why I had to bite the bullet and buy it from my fabric store instead. The white satin ribbon cost 50 cents a metre and I used 2 metres. Total cost: €15 fabric + €9 pattern + €1 ribbon = 25 euro ($34). Not bad, eh? 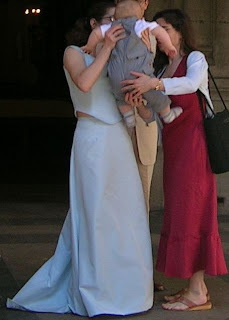 I joked with Sébastien that my TWO made to measure, one-of-a-kind gowns cost me together less than his suit and shirt (although God knows we were thrifty in that regard, too. BTW, we went shopping for his suit and shirt with scraps from my gowns, to make sure they would match perfectly!). I do wish I’d had the skills to make his suit or at least his shirt, but I certainly haven’t reached that level yet. Making clothes for men is a whole other story, so I had to be content with hemming his pants myself and changing the jacket’s buttons as per Seb’s liking. with my brother accompanying at the cello. 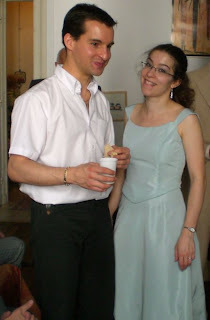 Right: with my brother Jean-François (28), cracking up as usual! Belated congratulations to you both. The gown is beautiful in its simplicity. I go for simple and elegant every time! 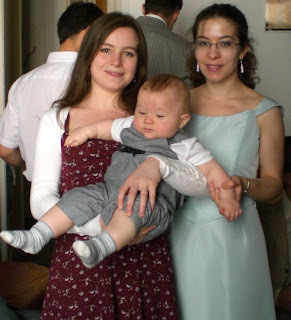 Lovely photos Isabelle, thank you so much for sharing such a personal a private occassion. Just one question: How did you manage to maintain your composurewhile singing such a wonderful song as Ava Maria on a day which can be quite emotional?